Every outstanding paint process starts with outstanding preparation of the vehicle surface to be painted. Our years of experience in street rod and collision repair prepping and painting delivers the best possible result to our clients. Our high end paint booth and extremely talented team enables us to deliver a flawless paint outcome. If it involves painting we at ISRC do it. Pinstriping by the legendary Bikini of Indianapolis, special effects, airbrush, the works. ISRC is an authorized, stocking Dupont shop but will spray whatever our client desires. 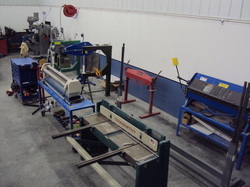 Fabrication, unique projects, panel creation, custom creations... at IRSC we can make it happen.